As friends start learning about my gluten free lifestyle, some think it's a challenge considering how much of a foodie I am. The good thing is, I love a challenge and a food related one at that! Already, I've been tempted with a whole lot of pastries and breads... but life is not over folks. Just because gluten is no longer part of my personal menu, it doesn't mean I can't enjoy pastries, breads and traditional gluten laden foods. (Gluten laden - is that the right term?) Take for example, pizza. I hosted a kitchen playdate pizza party with fellow moms and their kids recently. While everyone was enjoying the traditional pizzas we made, I tried my hand at my first Gluten Free Pizza Dough. Surprisingly, it was quite good! I still have yet to play around with the various types of flours but using a gluten free all purpose flour mix worked out just fine. Until I feel more comfortable with making my own flour blends, I'll be sticking with this pizza dough recipe. It's light, springy and has a great chew, perfect for topping any way you like... just like traditional pizza dough. Now in the kitchen, I'm no one to judge when it comes to using prepared baking mixes. This definitely applies to gluten free (GF) baking. The topic of GF baking is so overwhelming - who knew there were so many kinds of flours with various properties, textures and flavors to consider? For now, I'm resorting to prepared GF flour blends as a substitute in baking recipes. The brands I've used so far include Bob's Red Mill and King Arthur's Flour - both have worked out fine so far. Usually you can substitute 1:1 with the GF flour blends which makes it super easy and convenient! GF baking requires some additional ingredients such as xanthan gum, which helps add volume and viscosity to bread and other gluten-free baked goods. It's made from a tiny microorganism called Xanthomonas Campestris and is a natural carbohydrate. When involving yeast with GF baking, other ingredients like eggs, vinegar or additional liquid are needed. It's all pretty new to me so bear with me if you're familiar with GF baking. I used Bob's Red Mill GF flour and tried their pizza dough recipe. Thanks to my friend, Colin, who is also living a GF lifestyle, he gave me some xanthan gum to play with. Aside from these two GF specific ingredients, I had everything else in my pantry. I was especially surprised by the texture. I really didn't know what to expect but was glad it came out the way it did. To me, it was like a focaccia recipe but I'm sure if I spread the dough out thinner, it would have been a bit crisper than chewy. However, some folks like their pizza dough chewy... so play with it as you wish. Preheat oven to 425 degrees. Line a baking sheet with parchment paper and sprinkle with cornmeal; set aside. Combine dry ingredients in separate bowl. Combine yeast, sugar and water in the bowl of a stand mixer and let stand about 5 minutes. Add egg and oil to wet ingredients to the stand mixer bowl, then add dry ingredients. Mix with the paddle attachment for a minute to thoroughly combine. The dough will be a bit runny, almost like a thick cake batter consistency. Scoop dough onto prepared parchment lined baking sheet and using a spatula, spread out the dough to form pizza crust. Once formed, allow crust to rest for 15-20 minutes uncovered. After crust has rested, cover with your favorite pizza sauce and toppings. Bake at 425F for 15-20 minutes or until top is browned to your preference. I'm going to e-mail this to my girlfriend. She's allergic to gluten. Thanks for sharing!! Pamel's has great gluten free mix. 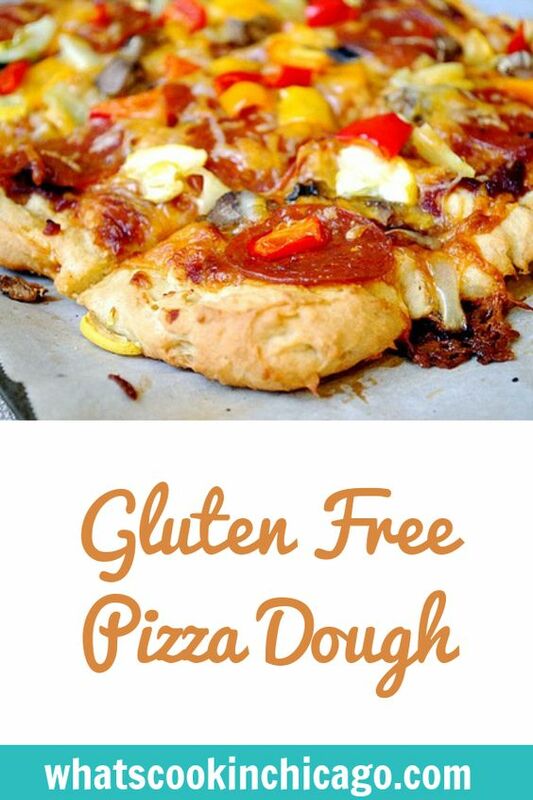 I have been trying many GF pizza recipes and package mixes over the last few months. So far, this is the best! Thanks! I was concerned when this recipe didn't look great or 'fluffy' in the bowl then again when I spread it on the pizza stone...but when we tasted it, we were dazzled. I am gluten free but my family isn't & they LOVED this crust as did I. Many thanks for an excellent, simple recipe that for a happy change didn't have a lengthy list of 'unusual' ingredients in tiny increments. This is an excellent dough & I will be trying calzone's with it very soon. I have not had pizza for quite a while. Will make some pizza. Thanks for sharing. Will make some on Saturday! This is the first gluten free pizza I have made from scratch that I have not been disappointed with! Plus, it was easy and the only ingredient I had to buy was the yeast. This will be my new go to recipe! Thank you for sharing such a delicious recipe. I like it..
Can you substitute agave or stevia for the sugar? I'm not a baker so I don't know if this would have an effect on the dough. Can u make this in advance and freeze it? Hi I live in Zambia and not only have I never heard of xanthan gum, but neither has our local health food store. I looked up substitutes and it said use flax meal mixed with water, do you happen to know the amounts? This looks so good! I especially like the fresh veggies on it...what a delicious meal. I used Bob's Redmill all purpose flour. When mixed the dough was not runny or like a cake batter. I topped it and baked it according to directions. The pizza rose but the only part cooked was the outside crust. Inside was a glue consistency. Should I use less flour, bake the crust first? Any suggestions please. @Mischief Max - its possible there was too much flour if the consistency wasn't as loose or runny. Be sure to combine the ingredients as directed and not to over beat so the dough doesn't get too tough (as it will result in a gluey consistency when baked.) Hope this helps! 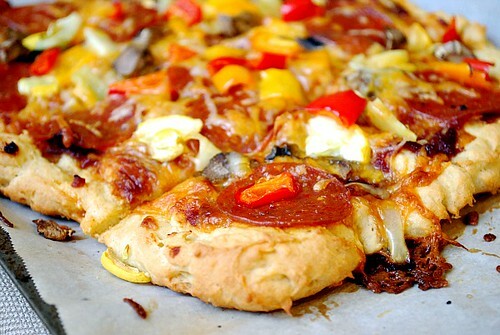 Loved this GF pizza dough rendition! Fairly easy and delicious. The consistency isn't overly filling like some pizza doughs can be. I substituted flax seeds for xanthan gum.